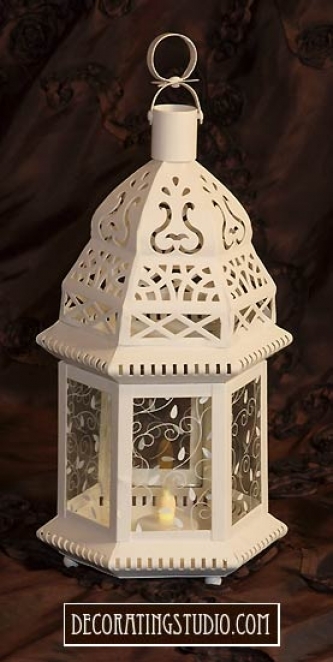 Candlelight shines from the cutout design of this lovely, lacy ivory lantern. Hexagonal hurricane shape in creamy ivory is stunning against lush garden greenery, casting a gracious golden glow on a twilit summer's night. Perfect for use as decoration for a summer garden wedding. Metal & glass. 6" x 6" x 12" high. Candle not included. Don't forget to check out our beaded garlands to drape around the base of your centerpiece - perfect for finishing off a wedding reception table. This topiary definitely deserves a place in our "cheap centerpieces ... that don't LOOK cheap" Collection! View all of our stunning centerpieces!